Brussels, 13 July 2017 - On 11-12 July the first European Summit for Entrepreneurship Education gathered experts, educators, researchers, business representatives and policy-makers to discuss the impact of entrepreneurship education and how to better develop entrepreneurial mindsets in Europe. Focusing on equipping young people with the right skills for tomorrow’s jobs, the summit actively engaged students, teachers, business mentors, and parents. 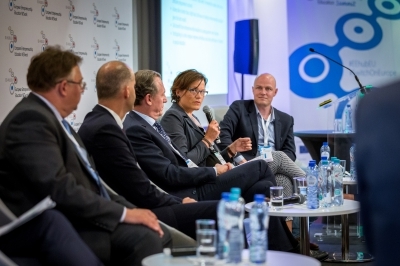 While young people were competing for the best mini-company in Europe - judged by business people – participants at the Summit were discussing how to increase penetration rates and build stronger national strategies. Research shows entrepreneurship education has a very positive impact on young people’s self-efficacy and entrepreneurial intentions. More of them start businesses later on and they are less likely to be unemployed. Organised by the European Network for Entrepreneurship Education consortium (EE-HUB), the Summit invited participants to learn more from the Innovation Cluster for Entrepreneurship Education (ICEE) field research on the impact of entrepreneurship education, discuss new trends in entrepreneurship education, share lessons learned and discuss policy recommendations identified by the EE-HUB experts. The Summit was notably the occasion for JA Europe to launch the European Centre for Entrepreneurial Learning in Brussels. Established in 2015, the EE-HUB gathers experts and educators, business representatives, policy-makers and educational institutions. 40+ experts from more than 20 countries are forming an advisory group for EU policy-makers. 25 MEP Ambassadors coming from 16 European countries are actively promoting EE-HUB through their policy work. “The EE-HUB is a response to the momentum that is in the “ecosystem”: there is demand from schools, from teachers, from business people and, most especially, from young people. Today, we estimate only 10% of Europe’s youth have access to this kind of education which means that we are quite simply not preparing adequately for the future.” said Caroline Jenner, CEO of JA Europe. The European Entrepreneurship Education NETwork (EE-HUB) is a focal point for entrepreneurship education in Europe bringing together organizations and individuals from both the public and private sectors with strong records of accomplishment in entrepreneurship education at regional, national and European level. The EE-HUB is designed as the space where these stakeholders can work collectively to increase levels of entrepreneurial activities in schools across Europe. The network is led by JA Europe, in collaboration with EUROCHAMBERS, SEECEL and EUproVET. It is also supported by private partners including Cisco, Citi Foundation, EY, Intel and VISA. JA Europe is Europe’s largest provider of entrepreneurship education programmes, reaching 3.5 million students in 40 countries. JA brings the public and private sectors together to provide young people in primary and secondary schools and early university with high-quality education programmes to teach them about enterprise, entrepreneurship, business and economics in a practical way.